Except musically challenged Mumble (voiced by Elijah Wood). In frozen Antarctica, where penguins sing to woo a mate, Mumble's talent is dancing: When his fellow penguins start to croon, Mumble's feet want to move. Even worse, Gloria (voiced by Brittany Murphy), the object of Mumble's affection, only wants to hear a song from Mumble's heart. 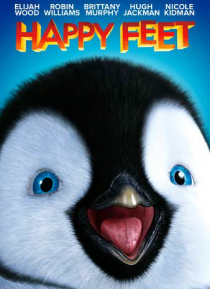 But when encroaching fishermen threaten the penguins, the… colony is saved by Mumble's valor, and Gloria's heart is won by his dancing, Happy Feet.